After a long wait it looks like we'll be able to import Ostrich bags from Japan. These are traditional cotton canvas bags and and panniers. 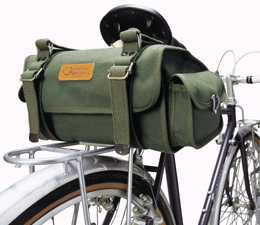 The handlebar bag has been made for over 50 years. The quality and design is very good. Here are photos of the three bags we'll stock initially. I won't have final pricing until we arrange shipping and figure out if there are any duties to pay, but they should be considerably less than certain French bags. As with all thing shipped from Japan, it may be a couple of months before we see them arrive. The handlebar bag is 260mm, wide 220mm tall, and 200mm deep with a capacity of 12.4 lt. This is big bag, with more capacity than a large size Berthoud bag. The saddle bag is 280mm wide, 240mm deep, and 140mm tall. Capacity is 8.2 lt. In addition to the Ostrich bags, we're working on having our own version of the TA bag made. They will be sewn right here in the US, but will look tres French. 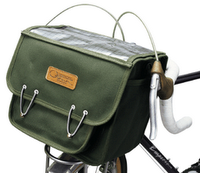 We will aso have a new small saddle bag, ala banana bag, and a large Velo Orange saddle bag. 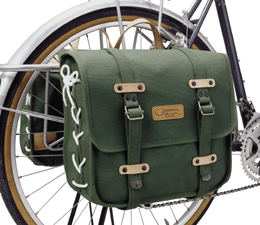 Eventually we hope to have small panniers that can be used with a front rack or with our constracteur rear rack. The Velo Orange baggage will be made in heavy brown waxed canvas. Does anybody hate, or love, the color of the Ostrich bags? Finally, we've decided to stock some inexpensive black nylon European type shopping panniers. Though you may not think they are in keeping with the high-end constucteur style items we carry, they are eminently useful. You can pop them on any rack, go to the farmers market, library, or beer store, and bring home a week's supplies. At $19.50 each, they are cheap enough that you won't think twice about owning large panniers, even if you never camp-tour. And you won't cry if they get nicked. I'll put them in the Velo Orange store later today. 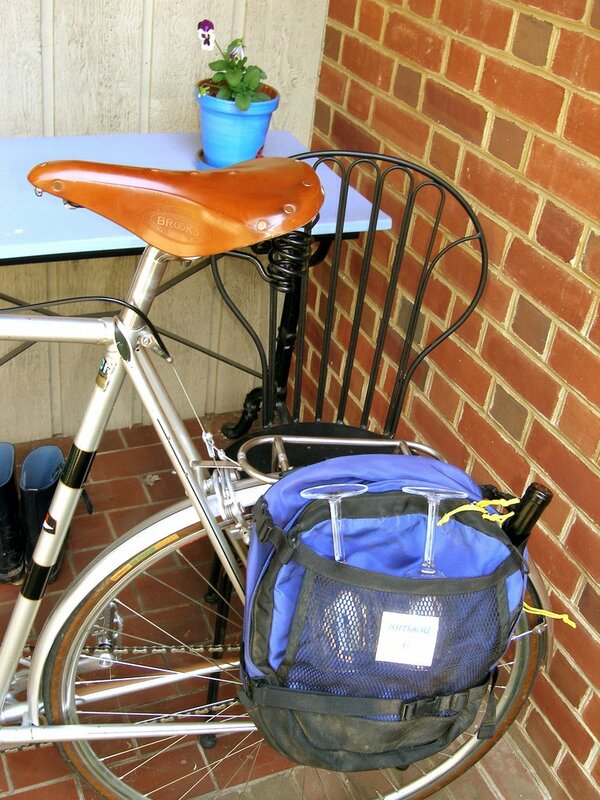 We'll also add both wicker and steel mesh baskets for shopping and city bikes. Here is a Herse front rack that I've not seen before. Looks familiar though. 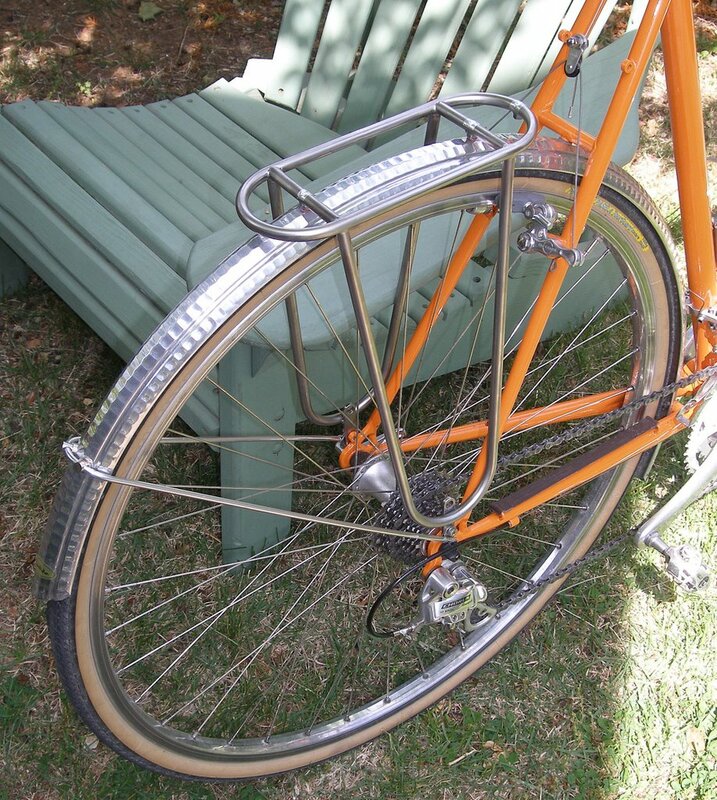 I think it's a little too big, but it might be another possibility for a Velo Orange rack. Like it? Anybody care to comment? More photos of this bike are available at the superb Classic Rendevous site. We finally have the regular credit card system set up, so you no longer have to go through Paypal when you order through the Yahoo store. We accept Visa and Mastercard, just like a real company. Unfortunately, overseas customers can't order using the Yahoo store yet; we're working on it. Anyone can still e-mail an order and use Paypal if they prefer. Since I'm working on the front and rear rack, handlebar bag, secret 650-b rim project (oops), saddle bags, and a bunch of other stuff, I don't have time to put in the few hundred miles of testing the covers should have. That's where you come in. I'll make up as many sets of covers as I can with the leather I have in stock, probably 8 or 10, and offer them to anyone who wants them for half price (or $14). They will include mounting tape, instructions, needles, and thread. The deal is that you have to agree to put them on right away, ride with them a lot for a week or so, and email me with a short evaluation. Also I'd like to know how long it took to install them and if the directions were clear. A few more details: We have our cutting die for the covers, but the design is not perfect. The covers have a slight nick on the edges near the middle. This won't be noticable once they are installed. We'll fix the die after I cut this run. I've left a piece of elk hide in a sunny spot for about 10 days. I treated one third with neetsfoot oil, one third with Proofhide, and left one third bare. 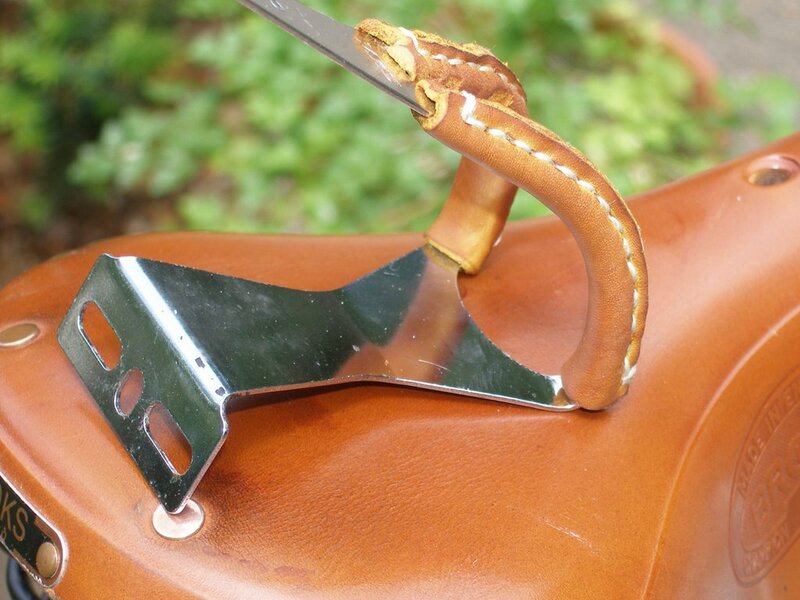 The neetsfoot oil part is the color of a honey saddle and looks great. The bare part is undamaged and a gold color. The proofhide part is a light tan and also look good. UPDATE: They are all gone. Thanks. Here are a few shots of the rack on my Ebisu. I'm rushing to mount it on my city bike next so I can ride downtown and get some lunch and see if there are any rattles going over the cobble stones. Thanks to input from readers and one day's testing, we'll make the radius at the bottom of the legs tighter. The legs will be about 1" shorter. The rack will be 0.75" longer. And I will look into a dedicated blinkey mount. Many thanks to all of you who wrote with suggestions and ideas. One more question: Do you think I should offer to drill the tangs (for a fee) for those who are not comfortable doing it themselves? Remember that this eats into time spent developing new products. Are any of you concerned about the drilling? 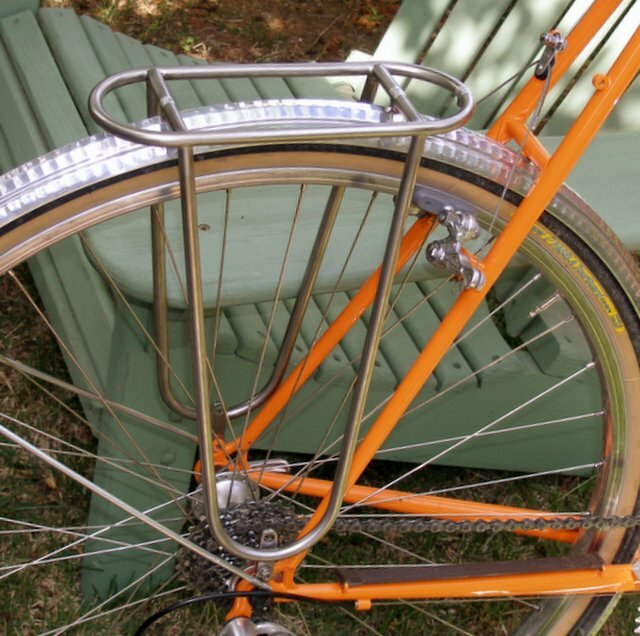 Here is the first of the Velo Orange Herse-style rear racks. 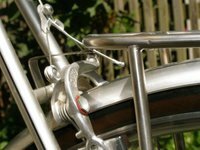 The detachable bar connects to the brake bridge, but bikes with metal fenders don't need the bar because the rack has proper bosses for fender mounting. It is all 304 stainless steel with the expected flawless welding. 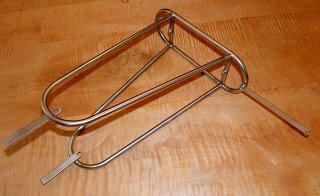 I hope this rack fills a need for an elegant and small superbly made rear rack for those of us who don't need a touring rack. It will accept a set of small panniers for a multi-day trip, serve as a platform for a saddle bag, or carry a rack-top bag. It is just big enough for a couple of baguettes or bottles of wine. A Sunday New York Times, a few books, or a box of doughnuts will also make an acceptable load. Notice that the tangs and the brake bridge bar are un-drilled. The customer will drill them to fit the bike. Thus the rack will sit as low as possible, right on the fender. This will improve both looks and handling. This prototype differs from the production version in a few small ways: The finish on this one is satin, the production version will be highly polished. I think we'll also make the platform on the production version a little longer. And there will be no holes in the top of the platform on the production version; the metal shop misunderstood how the bosses should be installed. I don't know the exact price yet, but I think it will be under $100. As with the decaleurs, the first run will be very small so we can test the proccess. If you'd like one please reserve it soon. There is no deposit required, just an e-mail saying you want one. I'll post a photo of this one on my bike later. Click on the photos to enlarge them. The next run of decaleurs has a satin, not polished finish on the bag mount bar. This is due to a specifications error on my part. But they will be as well made and identical in every other way to the first run. If you want a shiny one, there are only a couple left. We have the dies for the elk hide handlebar covers and they should be available by the end of this week. I'll post photos tomorrow. The Data Book is one of my favorite cycling books. It was originally published in September 1983 in Japan by Noguchi-san, president of the Yoto Ringyo company. 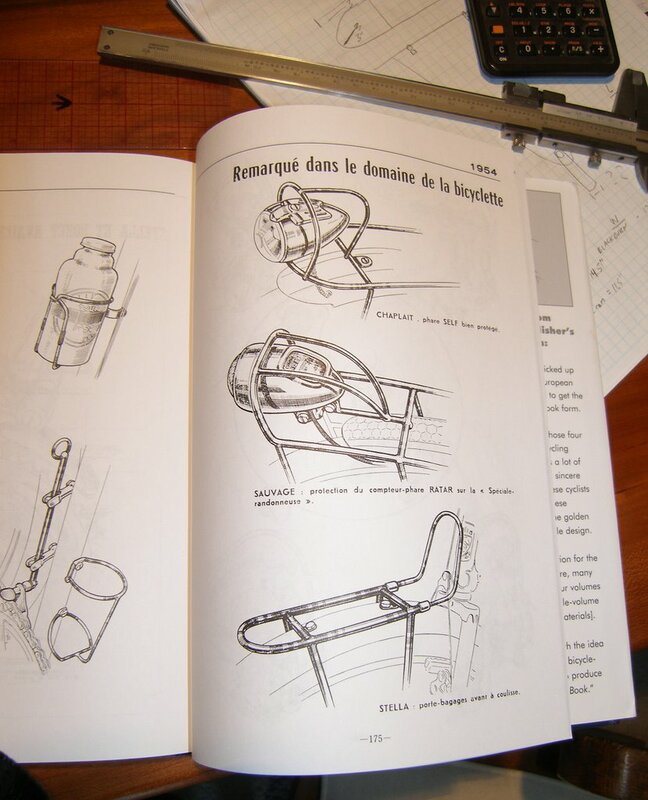 It culminated Mr. Noguchi’s long work as a collector and propagator of illustrations of early European bicycle components and accessories. This volume is a reprint edition of the original Japanese publication: ’83 The Data Book. Some of the materials had earlier been published by him in four separate volumes, referred to as Data Books 1, 2, 3, and 4, and a subsequent compendium volume (though significantly less inclusive than the current work), which he referred to as The Joyful Bicycle. This authentic reprint edition is identical to the original in all respects, including binding style, trim size, and page numbering. In addition, it contains English translations of the Japanese texts found on the introduction page and elsewhere in the book. 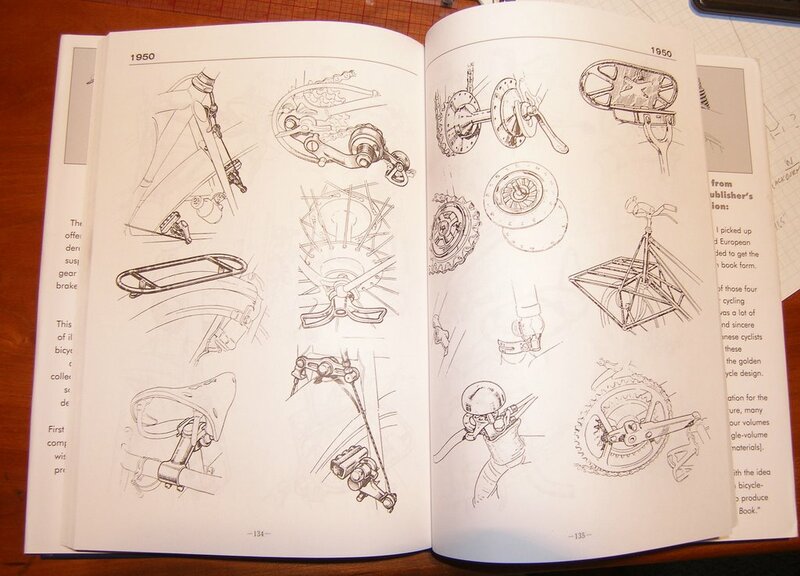 It contains more than 1,200 illustrations of every conceivable detail of the bicycle. And it spans the period from the origins of cycling in the early 19th century through the 1970s. Hundreds of the line drawings are by the famed French illustrator Daniel Rebour. Ottavio Bottecchia was the first rider to lead the Tour de France from start to finish, winning in 1924 and 25. He was known as "Le Macon de Frioul" (the Mason from Frioul) and was a hero to all of Italy. But this post is not about Bottecchia's racing career, but about his death. In 1927 Ottavio died under mysterious circumstances. He had gone on a training ride and was found bloody and beaten by the side of the road near a vineyard. He soon died of his injuries. Some in the Italian press claimed, based on the official police report, that he had crashed. But Bottechia's bike was propped up neatly at the side of the road undamaged. Others said he had stopped at the vineyard to eat a few grapes and was beaten up by a furious farmer, but the grapes had not yet ripened. Though some say a farmer confessed to hitting him in the head with a stone. It is far more likely that Bottecchia was murdered for political reasons. Italy was in the midst of a Fascist take-over. As so often happens in difficult times, some people were willing to trade freedom for a sense of security. And, predictably, the right wing had stepped in to take advantage. Benito Mussolini and the Fascist Party badly wanted the support of Italy's great sports hero. They had already been using him as a role model for their vision of a fascist Italy. 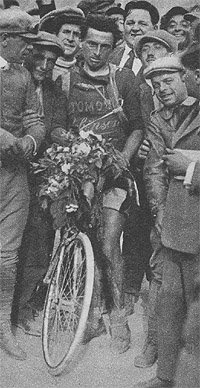 But it seems that Ottavio Bottecchia was no facsist. Some said he was a socialist and was willing to speak out about his beliefs. And for this the fascist thugs had good reason to murder him. His injuries included a fracture at the base of the skull, a broken clavicle, and many bruises. Yet no one dared call his death a murder. And so the Fascists came to power and launched a senseless war in Ethiopia; it is easier to consolidate power during a war. Soon Mussolini joined Hitler in an attempt to conquer all of Europe. And he eventually was excecuted and hung from a street lamp in Milan along with others of his ilk. 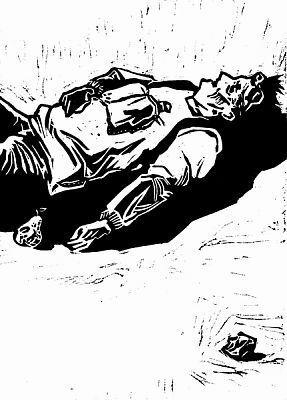 Some time later, in New York city, an Italian immigrant, on his death bed after being stabbed, confessed to being hired to murder Bottechia. The priest who administered last rites to Bottechia confirmed this story from his own death bed in 1973. Framemaker Teodoro Carnielli, a longtime friend of Ottavio's, created frames bearing Bottecchia's name. 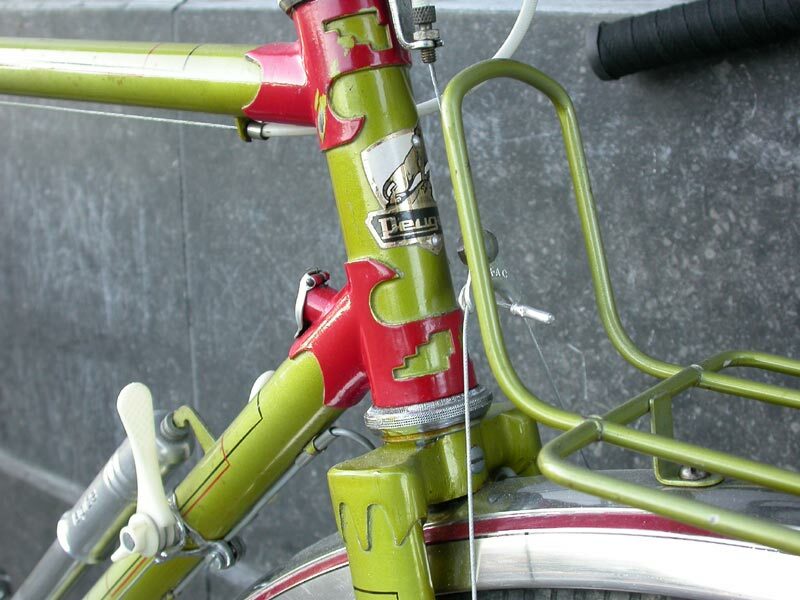 These frames, later produced by Carnielli S.P.A., have been ridden by five Italian champions and four world champions. Greg Lemond rode a Bottecchia when he won the 1989 Tour de France. 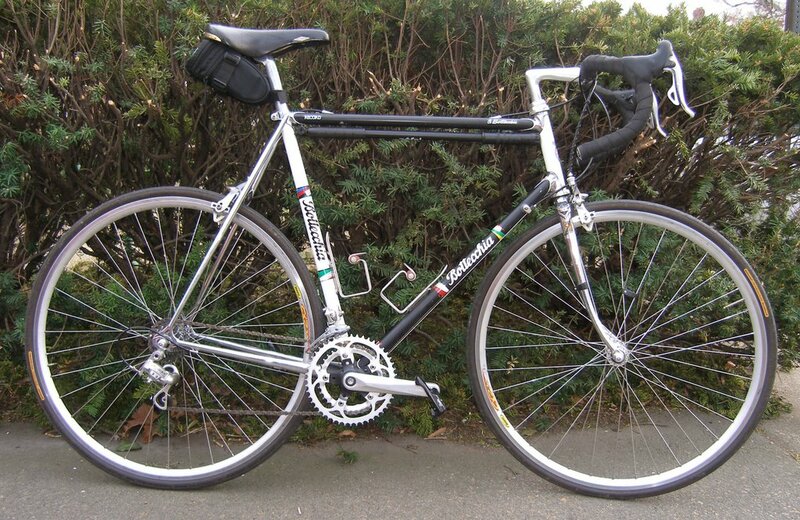 I am the proud owner of a 1989 top-of-the-line Bottecchia. Even in the glory days of French cycling, not everyone could afford a Singer or a Herse. So what was the French lunch-box-kind-of-guy to do when he wanted a randonneusse. 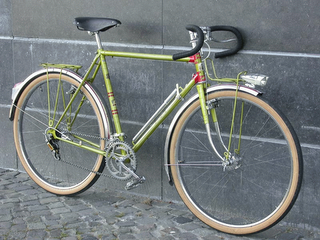 One option was to get a Peugeot PX50, a production randonneur bike. The photo shows a 1962 model. It's equipped with Nervar cranks, a 4-speed freewheel, Simplex Prestige derailleurs, Mafac cantis, Lyotard pedals, and those chubby 650B tires. It's just the thing for a rough French country road. The front rack is perfect for a handlebar bag and the rear would take small panniers. 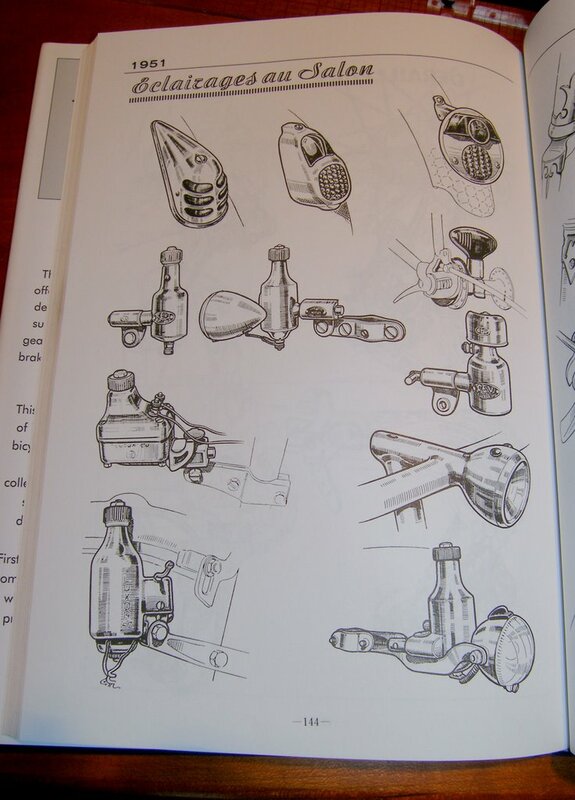 Also note the Cibie lighting system and the cool brake levers. The saddle is an Ideale 41. Replace that rear changer and you'd have a dependable and superbly capable all-arounder. I see that the first catalog to list this model is the 1953 edition. It seems to have disappeared sometime between 1963 and 1969. Apparently not many made it to North America, but they were sold in Japan. Here's a link to a Japanese catalog. 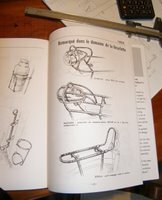 The photo and information is taken from Cycles Retro Peugeot , a wonderful collection of Peugeot catalogs from 1929 to 1989. Now look at the second photo. What the heck is that little lid on the down tube for? 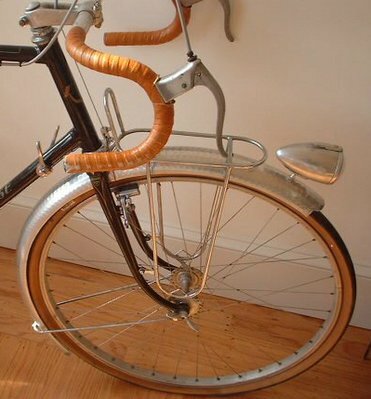 It occurs to me that the modern version of this bike might be the new Kogswell Randonneur/Porteur. How do you like this toe clip cover? I'm thinking of having a die made so we can produce these. Not only do they look cool, but they should keep your toes a little warmer in the winter. I suspect their original purpose was to protect the polished leather cycling shoes that were worn back in the day. I wonder if I should include the holes that the originals have? Since this would be a fairly expensive die, I'll only make it if a number of you express an interest in them. I think the cost of the covers would be between $10 and $15. What do you think? 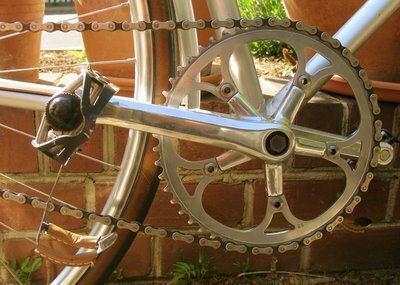 By the way, the image is from the Classic Bicycle site, http://members.aol.com/satorumas/, which offers a wealth of information and photos. Of course, it is in Japanese. 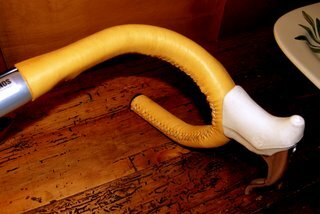 In other toe clip cover developments, I made a set of covers for myself from a thick honey-colored leather I'd bought for chainstay protectors and flashlight covers. It's thick enough that I had to wet it before sewing it on, but it looks super. Left untreated it is the color of the original Christophe leathers, but with a little neetsfoot oil rubbed in it exactly matches my Brooks honey saddle, exactly. I'll make these a new item in the Velo Orange store later today. 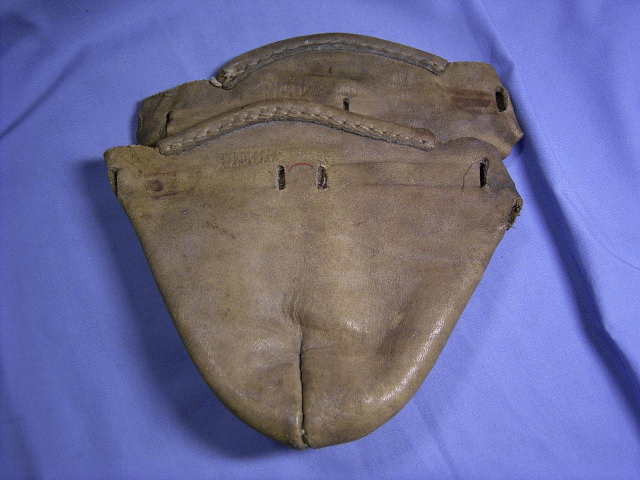 The last photo shows an old PATURAUD No.38 PIESCHO toe cover. I recently made a top tube protector for a customer. Kristopher wrote this wonderful description which I'll post in it's entirety.
" I won't be the first to note that one of the very best things about track bikes is their simplicity. I'd be loathe to add anything to my simple and clean old Panasonic, even if the velodrome officials would permit it. But a top tube protector is one track bike accessory is that makes sense. You see, with neither significant trail nor a rear brake cable to slow their momentum, the bars of a parked track bike can swing around in the blink of eye and easily dent the bike's gorgeous, skinny top tube. The damage isn't usually structural, but it's right there in the single most visible spot on the bike, reminding the rider forever not of some glorious crash but of a moment's inexcusable inattention. Who wants that? 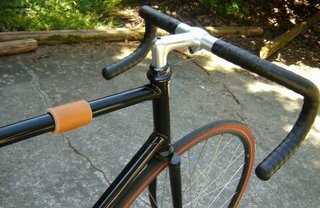 Even Japanese Keirin riders--who are notoriously hard on and indifferent to their equipment--clip top tube protectors over their track frames. You can buy the same NJS-approved top tube protector that the Keirin boys use. It's made by Kashimax of rubbery plastic and steel, sold by a handful of North American shops, and costs an eye-watering $50.00. It looks cool in the package, in that odd Manga/microcar/Hello Kitty way that mostly serves to remind that our aesthetic cultures are not yet a perfect marriage. The Kashimax protector ages badly, though, with the plastic layer quickly yellowing and bubbles forming underneath. 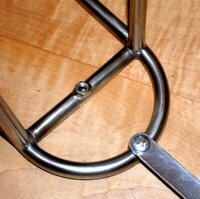 With all this in mind, I requested of Chris Kulcycki that he make me a top tube protector in the spirit of the other products he's been introducing via his Velo Orange site. I received the prototype of thick leather two days later. The cowhide is reminiscent of that used by Giles Berthoud for bicycle mudflaps, but softer. The edges are cleanly cut and nicely chamfered. Chris had cut holes for stitching and enclosed some heavy wax string, two stout needles, and stitching directions. As a left-coast America-hating liberal (or so I'm told), I was momentarily stymied by the suggestion that I use a baseball stitch. Eventually a helpful daughter wrestled a baseball away from the dog and brought it to me. Five minutes later and the top tube protector was in place. And is it gorgeous! The deep tan leather looks fantastic on my old black Panasonic. It's hard to imagine a bike whose looks it wouldn't improve. 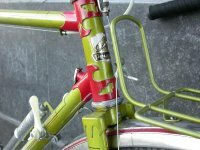 And it's nice to know that another decade of use might enrich the bike's patina, but that won't include any nasty old dents. I think the leather band makes a statement with which I'm comfortable; something about how I not only acknowledge that I'm riding a bike older than most of the riders against whom I am competing, but that I appreciate the fact. That I might actually seek out, rather than be settling for, an old machine. And that I deserve that bike, because I know how to treat it right. Not a bad effect for twenty-or-so grams, a few dollars, and five minute's work. Highly recommended for any track bike or fixie lacking a rear brake." These cost $12 in the Velo Orange store. Many riders consider beeswax an essential shop tool. 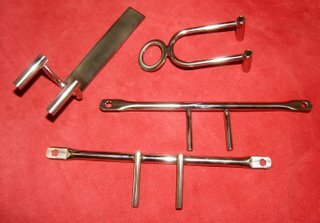 It's used as a retainer for screws, bolts, and dust caps that loosen. 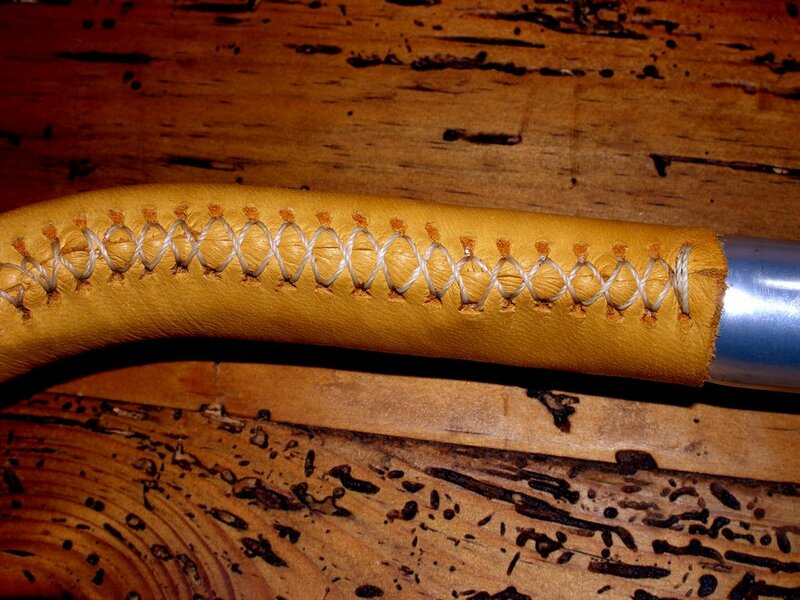 It's used to coat twine on handlebar tape. A bit at the end of your screwdriver or allen wrench will hold a screw destined for a hard to reach spot. 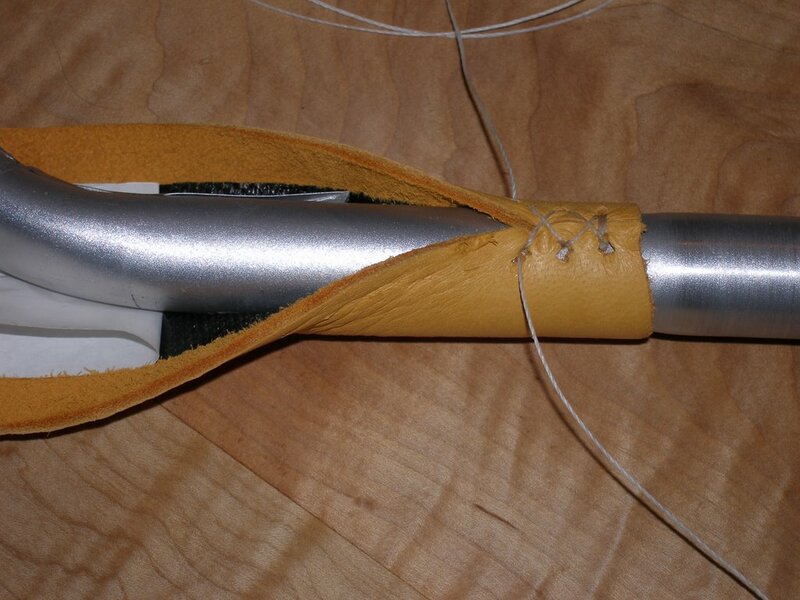 It even lubricates thread for sewing. We've been buying honey and candles from Joe, the local bee keeper, for years. 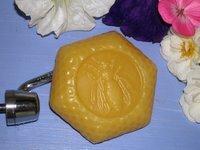 He also makes these little cakes of pure bees wax for use in the shop or sewing room. $3.00 in the Velo Orange Store. By the way, if you've never had fresh unpasturized honey, you're missing a real treat. I'm glad to see recent interest in Mafac mini-racks. 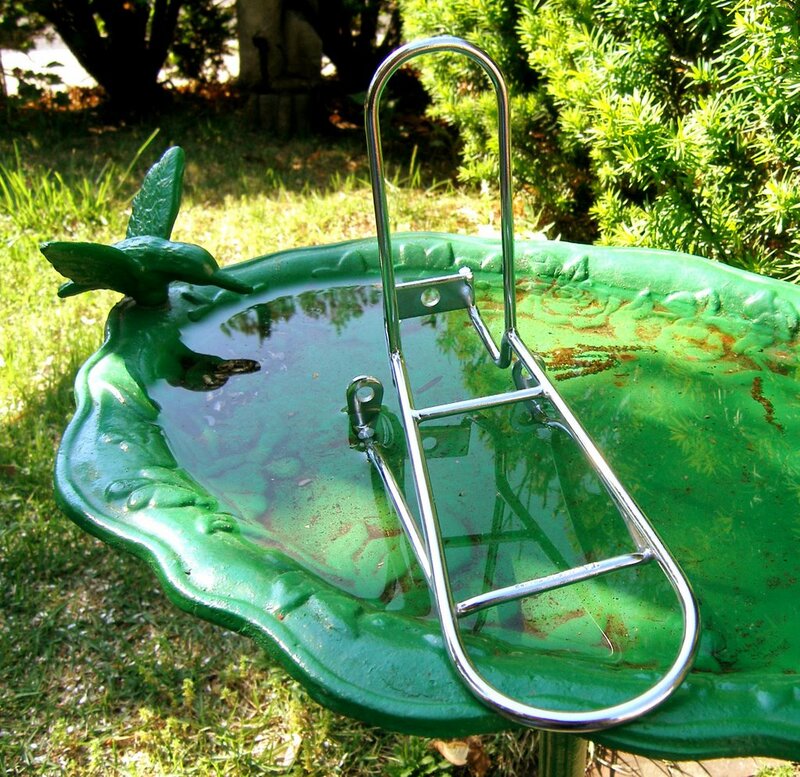 These racks are not only adorable, but they're well made and effective, so long as your load is fairly small. Of course, they do require that your bike have Mafac center pull brakes. But that's hardly a hardship. When I first started riding, the rule was, "Campy brakes for racing and Mafacs for touring." With modern pads Mafac brakes have superb stopping power and wonderful modulation. There are numerous models, most of which provide loads of reach and clearance for wide tires and fenders. They can be bought cheaply since so many were made and they will fit almost any bike. For many years the Mafac Racers were found on the cheapest gas-pipe clunker and on the finest constructeur specials. How many components can you say that about? But back to the racks: the main complaints about them is that they don't mount level, they're very small, and they restrict fender clearance. Well they don't mount level; okay, fair enough. And they are small, but they are just perfect for supporting a handlebar bag. Which is what a front rack should do. They also have two thin bars that go under the calipers so clearance is restricted by a tiny amount. But my city bike has 27" wheels, it's made for 700s, and wide fenders-- there is still tons of clearance. So if you want to spend $90 on a Nitto front rack, or a couple of hundred on a custom job, that's fine; I have. But I just bought my second new-old-stock Mafac rack for a lot less. Here's a 1979 poster showing various Mafac brakes, quite a selection. 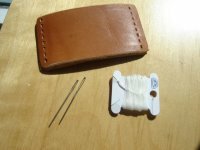 I wanted to let everyone who reserved a Velo Orange decaleur du sac that they are here. I'll give them a light buff and inspect each one today and start shipping tomorrow morning. So you can paypal at your convenance. The price for those who reserved them is $48 plus $4 for priority mail postage. I think we'll have just a few extras and I'll put those in the Velo Orange Store soon. The second production run will be ready in about 2 weeks. All the decaleurs we've recieved payment for have been shipped. There are now some in the Velo Orange store. These things are so shiny that they are hard to photograph. We've had several requests for black mudflaps, but I've been unable to find 1/4" thick black hides to cut them from. 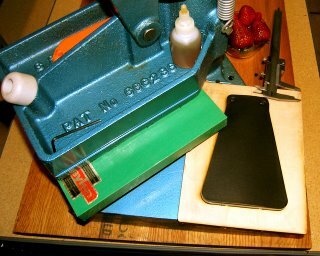 I did, however, find some very stiff 1/8" to 3/16" leather that we used to make a small run of black flaps. They are very nice and also a little cheaper than the uber-thick honey flaps. $8 in the Velo Orange Store. All of our leather product have been hand cut up to now. While this is quaint, the quality was worrisome. 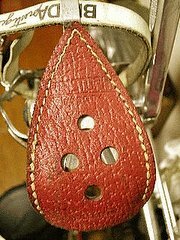 Sewing holes in the toe clip covers were not always perfect and the mudflap mounting holes could be out of square. So we invested in a die cutting machine and had dies made for our leather parts. These dies are laser cut with incredible precision and the press presses with 5 tons of pressure. You should see a huge improvment in the quality of our leather parts starting today. Now for the recall: a customer has told us that the black finish on the red/black toe clip covers wears off easily. He is right! That was a bad choice of leather. We now have a new high quality black leather, made for motorcycle jackets. If you bought the black/red and want the new black leather toe clip covers, just e-mail. There is no charge for replacement and no need to send back the old set. Finding the right leather for our Velo-Orange handlebar covers has been a challenge. It has to be thick with good cushioning propertries and stretchy enough to form around the bar's curves without wrinkling. I've tied numerous cowhides tanned in various ways, but either they were too stiff or too thin. Deerskin seemed promising, but it is simply not thick enough to provide the level of cushioning I wanted. 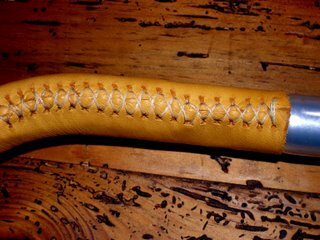 Finally my leather supplier suggested elk hide; it's absoulutly perfect. The cushioning seems as good or better than cork tape. Actually elk hide is so soft that it is very hard to cut by hand. I tried a razor knife and even special scissors made for cutting fiberglass and kevlar cloth, thus the slightly ragged appearance of the prototype (click on the photos to enlarge). The production handlebar covers will be cut using a special die on our brand new die cutting press and so the edges and fit will be much better than that shown in the photos. We'll also ship it with a thicker thread. The other problem with this grade of elkhide is that I've only been able to find it in honey and white so far, but we're searching for a source of black and brown. As for installation, figure about 2 hours if it's your first time. Put a good movie in the DVD player and stitch as you watch. The stitch used is not a baseball stitch, but a cross stitch that, I think, looks nicer. Comprehensive illustrated instructions will be included. We should have the first production covers ready in about two weeks. The price will be $28 per set. 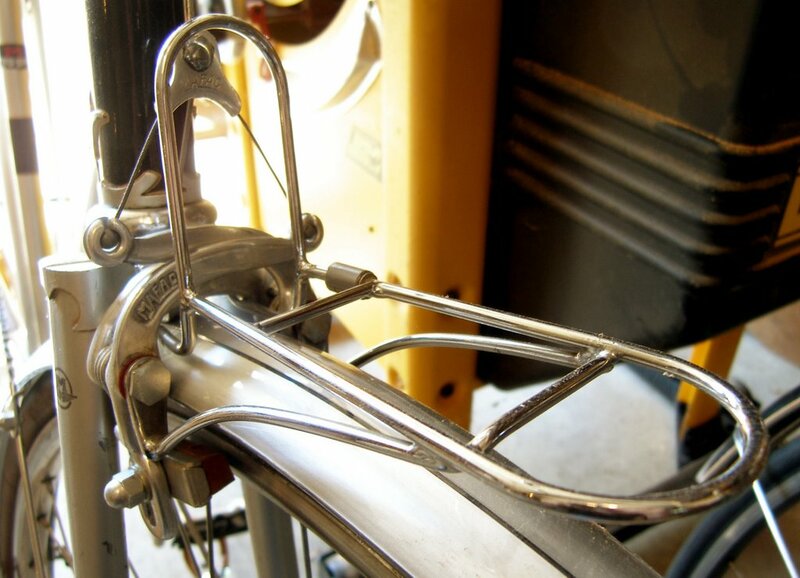 Many connoisseurs of fine French bikes seek out old TA Specialties and Stronglight cranks. This is understandable as both companies made beautiful and practical cranksets that were fitted to the finest bicycles. But there is a third brand, Nervar, that also made top quality components and whose cranks were occasionally used by even the best constracteurs. The relative anonimity of Nervar cranks makes them a bargin. 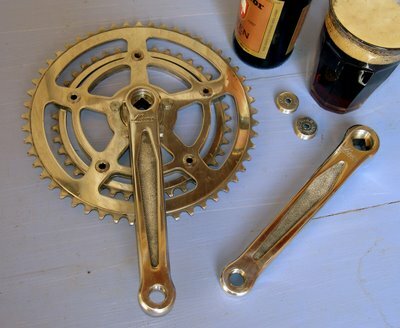 I bought the crankset in the first photo for about $20 on E-Bay. Yet it is as well made and takes the same chain rings as a TA Cyclo-Tourist or a Stronglight 49D crankset, either of which usually sell for over $100. As for appearance, I think the the 49D is a bit more elegant, but I find the Nervar prettier than a TA. The great thing about this 50mm-bcd bolt pattern is that you can run a wide range double, say a 46 and 30. This means that with a modern 9 or 10-speed 12-27 cassette you'll have the equivalent of a triple with only two chainrings and standard cage derailleurs. And most riders will find that they stay in the big ring 90% of the time with plenty of gears on either side of a normal 16-19 mph cruising speed. A lot of readers have e-mailed asking about the flashlight I use and show in the Velo Orange flashlight bracket. 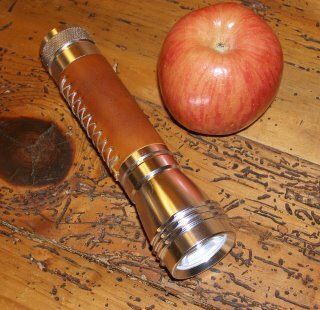 It's a Task Force 3-watt LED light. We don't sell it, but you can order one from Lowes. I've found this light to be very effective and probably the best value in LED lights available. There is a review of it here. 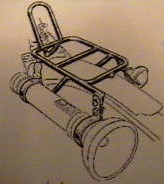 The lower drawing shows a traditional flashlight and bracket.